Molly Bobak CM ONB (February 25, 1922 – March 2, 2014) was a Canadian teacher, writer, printmaker and painter working in oils and watercolours. During World War II, she was the first Canadian woman artist to be sent overseas to document Canada’s war effort, and in particular, the work of the Canadian Women’s Army Corps (C.W.A.C). Born Molly Lamb on February 25, 1922, she grew up in Vancouver, British Columbia. Her mother, Mary Williams, initially worked as a housekeeper for Molly’s father, Harold Mortimer-Lamb, when his wife became ill. At some point, her parents decided to move in together along with Mortimer-Lamb’s wife and their children. Molly and her extended family seemed to live happily in this unconventional household. Mortimer-Lamb was an art critic and collector who befriended the artists of the Group of Seven, who would visit the family on occasion. Moly’s reputed poor eyesight and dislike for her teachers left her with poor school marks. Recognizing this, her mother encouraged her to enroll at the Vancouver School of Art studying with artist Jack Shadbolt, whom she would remain close friends with all her life. Shadbolt enthusiastically encouraged her, and led her to discover European artists such as Cézanne and Matisse. 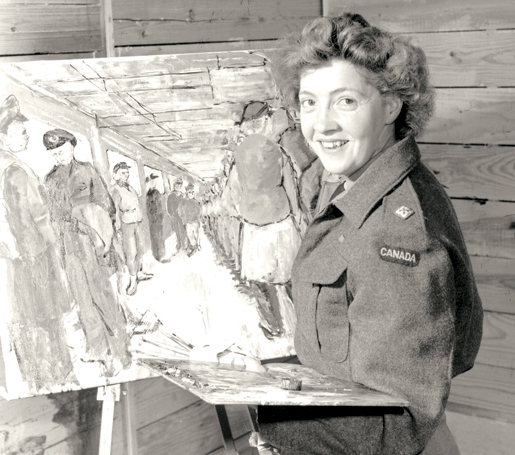 Fresh out of art school, she joined the Canadian Women’s Army Corps in 1942. She longed to be sent overseas and follow in the footsteps of her family friend A.Y. Jackson, who had been a war artist during the First World War. After V-E Day in Europe, she got her wish and was sent to London. There she met her future husband, 21-year-old Bruno Bobak, Canada’s youngest war artist. The couple soon married. Ms. Bobak remained with the women’s corps until 1946, documenting their training, marching and working. 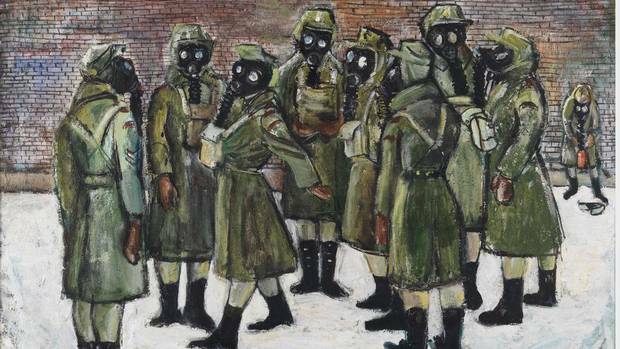 Her painting Gas Drill, for example, shows a group of women trying on black gas masks. All looking in different directions, the women appear curious but not sure what to do with the masks, Dr. Brandon said. Ms. Bobak also painted backstage at army shows, depicting women getting dressed for the performances, and at a wedding feast, where she focused on the luscious food. Bobak enlisted in the Canadian Women’s Army Corps (C.W.A.C) in 1942 and stayed for four years. This was a vast opportunity as it allowed her to travel and gain new skills. She traveled across Canada and after Victory in Europe Day she went to London, England where she met her future husband, artist Bruno Bobak. As part of the C.W.A.C., she was appointed to document training, marching, working and any other contributions to the war. After the end of the war, the Bobaks had a son, Alex, and tried to make a living on the West Coast by painting, teaching, and other various jobs. She painted little during these years, as she was busy looking after her children and teaching painting at night school. However, she met Jacques Maritain, a French Thomist philosopher and Vatican ambassador to the United States. He was impressed with her work, and arranged for a visit to France on a French Government Scholarship. Alan Jarvis, Director of the National Gallery of Canada was also impressed by her work, and invited her to participate in exhibitions such as the Sao Paulo Biennial and the Vancouver Art Gallery’s Third Canadian Biennial in 1960. Through these exhibitions, she was able to enjoy increasing financial success and popularity. After spending four years in Europe with money from a grant by the Canada Council, Bruno was offered a position teaching at the University of New Brunswick in Fredericton, New Brunswick. Bruno and Molly settled in Fredericton, where she continued to live. In 1973, she was elected to the Royal Canadian Academy of Arts, and in 1993 the MacKenzie Art Gallery in Regina, Saskatchewan organized a major touring retrospective of her work. Bobak is now most widely recognized for her depictions of crowds of people and her work from WWII. Her paintings of crowded scenes serve to record public events and visual experiences of large numbers of people sharing the same space, time and celebration. Molly Lamb Bobak died March 2, 2014.